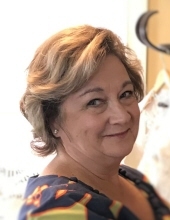 Holly A. Stanford passed away unexpectedly Thursday, January 24, 2019 at Duke University Hospital, Durham, N.C. with her beloved husband, daughter, son and daughter in law by her side. Holly was born January 6, 1958 in Durham to Mr. and Mrs. Philip B. Alford. She married Morris E. Stanford, June 16, 1984, and spent 34 years building a life and raising a family. Holly graduated from Durham High School in 1976. She then went on to study radiology at Duke University. Upon graduation, Holly worked at Duke Hospital for 35 years in the radiology department prior to retiring in 2014. She is survived by her father, Philip B. Alford, brother, Boothe Alford (New Orleans, La), husband, Morris, and two children, daughter, Cally Stanford, and son, Alex Stanford and wife Megan. Also surviving are three grandchildren, Lacy, William and Hunter. Holly was preceded in death by her mother Ara B. Alford. In the last few years Holly has enjoyed traveling, creating quilts for many friends and family, and spending time with her loved ones, especially her adoring grandchildren. Holly also loved gardening, searching for seashells on the beach, watching the sunset with her husband and joining him and their many friends for dinner or Tar Heel sporting events. Many who knew Holly will miss her compassionate personality, ability to make anyone laugh (including herself), and profound desire for giving, whether it be advice on life, a home cooked meal or a token of her love. Holly received remarkable care under the expertise of the many doctors, nurses and staff in the Neurosciences Department at Duke University Hospital. The family extends their gratitude and admiration to the people of Duke Hospital where she spent the duration of her career, and in the end, spent her final days. The family invites you to join them for a visitation at Clements Funeral Home, 1105 Broad St, Durham, N.C. on Wednesday January 30, 2019 from 6:00PM-8:00PM. A celebration of life will be at Asbury United Methodist Church, 806 Clarendon St., Durham, N.C on Thursday January 31, 2019 at 11:00AM. Donations may be sent in memory of Holly to Union Grove United Methodist Church, 6407 Union Grove Church Rd., Hillsborough, NC 27278. To send flowers or a remembrance gift to the family of Holly Alford Stanford, please visit our Tribute Store. "Email Address" would like to share the life celebration of Holly Alford Stanford. Click on the "link" to go to share a favorite memory or leave a condolence message for the family.